Nuit Blanche, a bi-annual festival, turns the downtown core into a civic art gallery for the night. On Sept. 20 from 7p.m. to 1a.m. thousands will gather to view the art on display. Focused around performance art, Nuit Blanche hopes to redefine the way the city sees creativity, hoping to bring excitement and celebration to the art form. 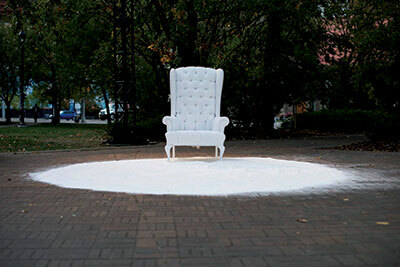 Taking place at Olympic and Municipal plazas, the art exhibition is highly anticipated, previously receiving accolades from supporters such as Mayor Naheed Nenshi. Supported by Invest YYC, “the Calgary stages” will host works produced by local artists Sarah Smalik and Wednesday Lupypciw. Both performances aim to captivate audiences by involving them in the unique process. This festival allows the audience to get into the performance to share a piece of themselves, which turns Nuit Blanche into a strong social experience truly engaging Calgarians with the art community. The goal of the event is to have community members experience the show “en-masse” at sunset on the date of the show. Donations for Nuit Blanche will be accepted until Sept. 22 at midnight will go to continuing to produce the project and can be facilitated through Invest YYC.